Then … The chase continues along the waterfront towards Pier 33 with the vengeful pod people in hot pursuit of Matthew and his friends. 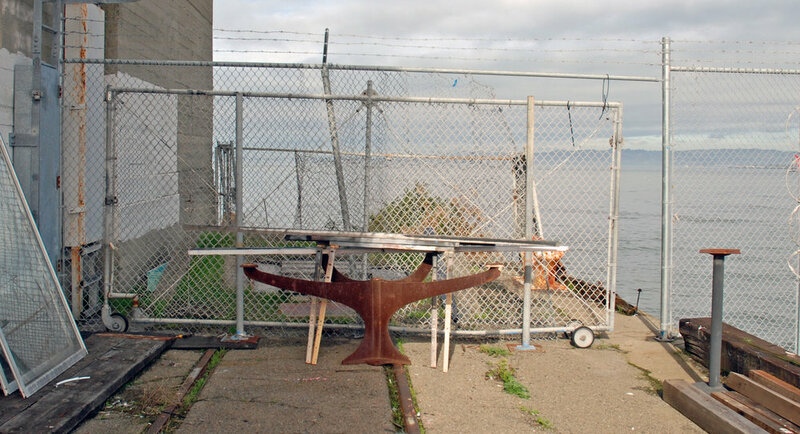 … and Now, The pier, on the Embarcadero near Bay Street (map), is now widely known as the ferry terminal point for daily Alcatraz Island visitors. 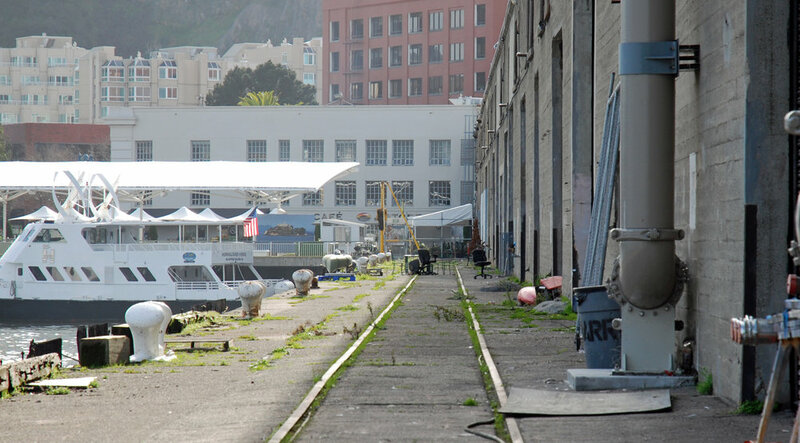 What used to be a large doorway at far right, above, is now the Alcatraz Landing Cafe, below. Then … They head into the cavernous pier, running towards us in this dramatic backlit shot. … and Now, here’s the interior of Pier 33 on a quiet Sunday morning as CitySleuth found it when he recently stopped by. Then … They exit a side door but their flight is arrested by a metal fence. 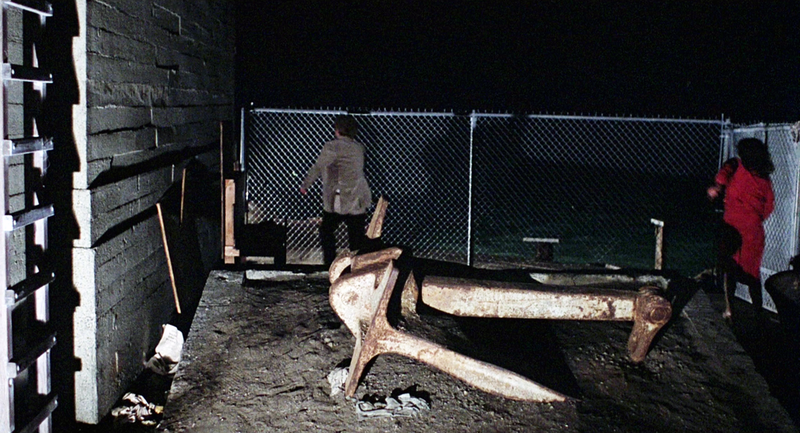 … and Now, This is is at the far end of the east side of the pier (map). As it turns out their chance of escape would have been stymied anyway by the waters of the bay. There’s now an additional fence erected in front of the original one. Jack offers to divert the fast-approaching pod people. In the blinding glare of a helicopter searchlight aimed from above he kisses wife Nancy goodbye. Then … He runs off, shouting loudly. But she chases after him. … and Now, the landing runs alongside Pier 33 (it still has an old railway track, no longer in use) in this view looking back to the Embarcadero. One of the Alcatraz ferries is seen on the left. Then … The ruse works; the angry aliens chase after them, leaving Matthew and Elizabeth safe, for now. … and Now, dimly seen above but clearly visible in the daylight below are, from left to right on the skyline, The Transamerica Pyramid, the former Bank of America Center (now named 555 California Street) and Coit Tower, rising from the top of the Filbert Steps.